I’ve just started watching Strange Hero Yi Zhi Mei on YouTube and I have to say I’m really enjoying it so far. Despite the odd title, this is a good old fashioned swashbuckling action series about a Robin Hood type character in old China that seems to be an adaptation of a Chinese comic book. The tragic but gifted hero and his three assistants do their best to right wrongs and kick the butts of scheming officials and other villains using their good ole WuXia martial arts skills. Having seen a few Chinese TV series before, I’d have to say that the acting and production values of this one are pretty high (even considering it was made in 2010) and overall the series is very well put together. The whole thing has been subbed in English, so it’s an easy watch and each episode ends with a cliffhanger of sorts so expect to be dragged in and find yourself racing along with these four before you know it! Amazon has just announced their new “Netflix for Books” called Kindle Unlimited. You pay US$9.95 a month and you can download and read all the content you want to your heart’s content. For readers it sounds like a great deal, but for writers it’s a mixed bag. Either way, it’s doomed to failure or at least in for a lot of hard times. Well, the first thing you need to understand is that Kindle Unlimited (KU) is part of the Kindle Select program for writers. Kindle Select is a bundle of incentives that Amazon gives writers to publish their eBooks exclusively on Kindle. You promise to only have your book on Amazon for 90 days, and they give you a bunch of extra ways to promote your book and profit from it. One of the biggest parts of this is membership in the Kindle Lending Library, wherein members of Amazon Prime can “borrow” one book each month for “free”. However, Select has been actually less profitable and worthwhile for independent authors the longer it’s gone on, mostly because of the sheer number of people in it. So, Amazon is constantly trying to come up with new ways to incentivize authors to join Select, and one of these things is Kindle Unlimited. Basically, all Select books are now part of Kindle Unlimited, and a book “bought” by a KU user counts towards the Kindle Lending Library Pool of money, so in theory Kindle Select authors now how two great ways to access Amazon’s Monthly Money Pool and get a bigger slice of the pie. Which on the surface seems like a great incentive to join. However, by linking the two programs to the same money pool, they may have just doomed both the Kindle Lending Library and Kindle Unlimited. With the Kindle Lending Library, each member could only get a limited number of “free” ebooks a month, so they chose carefully which ones they read. However, with Kindle Unlimited, you can read as many books as you want, and each of them counts towards a share of the money pie, and there’s no limit to the number of books an author can sell. This creates a huge problem for Kindle that I don’t think they saw coming. For example. Let’s say I’ve got a book on the market that has 31 chapters. If I was a smart man, what I would do is take that 31 chapter book and divide it into 31 mini-books, which I would then put up on Kindle Unlimited as a “serial”. Then, I would go over to Fiver and pay a stranger who has a Kindle Unlimited account $5 to “read” and click through each of those 31 chapters. (Which might take them minutes, so totally worth $5.) They make $5, and I get 31 shares of the pie, which is likely more than $5 in value- at say 50 cents a read, that’s $15.50- triple my money! Even with my initial cost out, that’s $10.50 in profit. Of course, I can take this even further. Say my book has 350 pages! Well, that’s 350 mini-books, and 350 shares of the money pie! Even at each share being worth 2 cents, that’s still a profit! Good times! And that’s just one Fiver person doing it, soon there will be dozens or hundreds of them offering this service, because they get $5 for 10 minutes work, or $30/hour doing this. (Or more!) I don’t even need real readers, or ratings or reviewers to make this scheme work! I can be doing this over and over, and making bigger and bigger profits as I do it. So, while the people who enroll in Kindle Unlimited with their books are getting 1 share if they honestly enroll their book, I’m getting 31 (or 350) shares of that same pie. Which quickly means that it’s stupid for them not to do the same thing I’m doing, and in fact if they want to profit they have no choice but to start gaming the system and fighting for their slice of the pie just like me! It will quickly become impossible to make a profit on it, so nobody will enroll their books there. No content means nobody will use Kindle Unlimited. Amazon could make KU invite only to stop this, but if they did so then it would defeat the whole incentive to get people to be part of Select. Amazon could set minimum lengths of books, but this is irrelevant since the point isn’t the content, but the number of “reads” a book gets, which is meaningless in this scheme. I can fill books with gibberish and still profit from them using this system. This will kill the Kindle Lending Library, because it means the share prices there will tumble down to nothingness. So, as you can see, Kindle Unlimited isn’t just a race to the bottom for Authors, it’s actually a race to the bottom for Amazon. It’s too gameable to work, and by the time they figure out a solution, nobody will care. 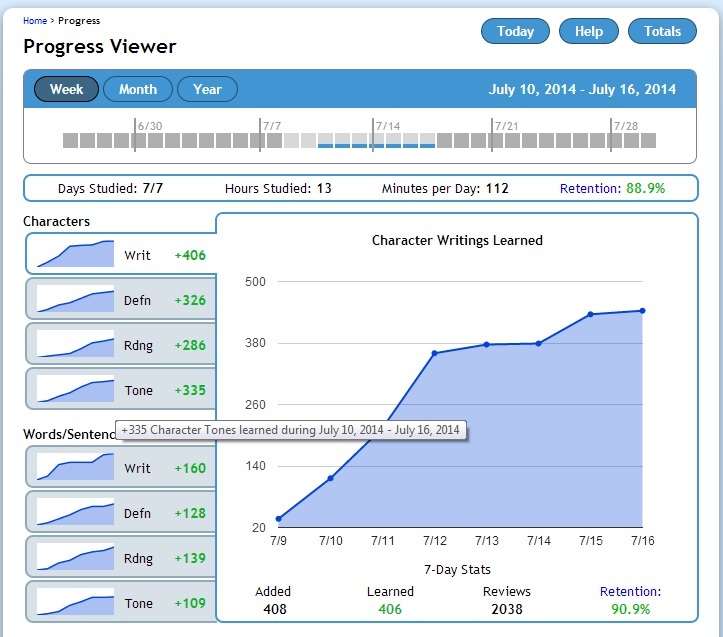 Yesterday, I blogged about the Chinese and Japanese writing study software Skritter, which I know some people are interested in, but turned off by the monthly subscription system they use. Well, good news! Skritter for Android is out and still in beta testing, which among other things means it’s free! So if you have an Android phone you can now be using Skritter to your heart’s content while helping them test the system. If you want to try it, go here and follow the instructions. Yes, you’re reading that right, as of this screen capture I’d learned 406 characters, in a week, in a little less than 2 hours a day with a retention rate of 88.9%. However, before I toot my own horn too much, I should note that this isn’t my first time studying Chinese, and when you see that big jump between the 9th and the 12th, what you’re seeing is mostly Skritter refreshing me on characters I already knew to some degree. You could say that my real learning started on the 12th at around 370 and continued to the 16th at 406, so I only learned and mastered 36 new Chinese characters in 4 days. Still, not too bad, though. And that’s just characters, it doesn’t include actual words using combinations of those characters. (I learned 160 of those.) I love checking my stats each day to see how far I’ve progressed and testing myself to see what new words have managed to stick into my head. Getting back on the Chinese studying bandwagon was one of my projects for the Summer, and thanks to Skritter it’s now taken a huge leap forward. Now, if you choose to check Skritter out, I have a few recommendations. When you sign up use a Referral Code (here’s mine), it gets you two extra weeks free. For better or worse, Skritter isn’t free, after the first trial week it costs US$8-$15 a month depending on how long you sign up for. That said, the program doesn’t stop working if you stop paying, it only stops adding new characters, so you can keep practising your current lineup for the rest of your life for free if you want, or pay for another month from time to time to add more content and then stop again. My advice is to just do the free one-week trial, then if you like it do a month, and finally if it’s really something you want to invest in then get a longer subscription. View it as a language class you’re signing up for, not like a normal App. This is a life-long investment of time and knowledge. Viewed this way, the price of a single meal at McDonalds isn’t that much. Don’t freak out or get intimidated when you see a large backlog of characters waiting to be reviewed. I’ve cleared away as many as 500 items in less than an hour, and if you feel overwhelmed it has various options to slow down the flow so you don’t get swamped. Don’t be afraid to let the App guide you when you meet a new character. (Just tap the middle of the screen for the next stroke.) Yes, it means you don’t know it (duh! it’s new!) but it’s not about scoring points (since there are none), it’s about having the App repeat it often until you do know it, and if it doesn’t know you don’t know it, it can’t give you the right amount of repetition for your memory. You’ll hate tones, we all do, just do your best. You can’t share a Skritter account with another person. It’s customizing itself to your own personal learning patterns and what you know and don’t know. If you try to share it with someone else for any length of time it will mess up your own learning. Skritter is a writing and vocabulary learning system, but they don’t teach grammar or give you speaking practice (beyond repeating what you hear), you can’t really learn Chinese (or Japanese) just from Skritter, you’ll need other resources like a textbook or classes. However, it does make it easier to focus on grammar when you’re learning if you already know all the vocabulary in your textbook! You can try the iPhone App free for a week through the iTunes App Store without creating an account or using any kind of credit card. (Be warned, any coupons or referrals can only be used when you first create your account!) I’ve heard the Android App is still under development, but you can use the mobile website on Android devices if you have an account. It’s been told before, but still worth reading again………….. BOTH are true and worth reading. Capone had a lawyer nicknamed “Easy Eddie.” He was Capone’s lawyer for a good reason. Eddie did have one soft spot, however. He had a son that he loved dearly. Eddie saw to it that his young son had clothes, cars, and a good education. Nothing was withheld. Price was no object.. But in his eyes, he had given his son the greatest gift he had to offer, at the greatest price he could ever pay. Laying aside all thoughts of personal safety, he dove into the formation of Japanese planes. Wing-mounted 50 caliber’s blazed as he charged in, attacking one surprised enemy plane and then another. Upon arrival, he reported in and related the event surrounding his return. The film from the gun-camera mounted on his plane told the tale. It showed the extent of Butch’s daring attempt to protect his fleet. He had, in fact, destroyed five enemy aircraft This took place on February 20, 1942 and for that action Butch became the Navy’s first Ace of W.W.II, and the first Naval Aviator to win the Medal of Honor. A month ago I wrote a post entitled How Much Should You Write a Day, where I talked about a minimalist approach to writing where you aim for a small daily writing goal instead of a larger one to keep word count from becoming a barrier to writing. Saying you want to write 2000/words a day is nice, but it can easily become an obstacle if you start to think it isn’t worth writing unless you have time to achieve that number. So, instead I opted for the smaller 250/words a day as my goal for June. Overall, it turned out to be one of my most productive writing months in almost two years, and the “it’s just 250 words” strategy ended up working perfectly because not only did I feel I could always pull off 250 words, but I never once wrote less than that. Once I was 250 words in, I was always warmed up and wanted to write more, and it tended to be life that made me stop rather than not wanting to write more. The 250/day word count was not only do-able, it was inspiring. Of course, I should comment that there were a few more factors involved. During June I learned to finally just let myself go, and dump the words on the page whether they were perfect or not. Also, I had an outline to work from, so I never really had to worry about where the story was going so much as what I wanted to do with a particular scene. If I wasn’t sure about a scene, I wrote down something that roughly worked and will go back to fix/replace it during editing and revision. This improved my productivity during the first draft stage immensely, and let me really just tell myself the story. I also became a Spreadsheet user, after years of resisting tracking my productivity I gave in, and it actually helped a lot more than I expected it to. Seeing those numbers line up for my daily word-counts was a real motivator, and wanting to go as long as I could without a dreaded 0 appearing on the spreadsheet was also a big factor. I took every 0 personally, and it made me really want to write harder to make up for them. Now, since I’m a masochist, in July I have an even bigger challenge! I’ve signed up to write another book (a mystery) for Camp Nanowrimo, and that will require approximately 1667/words a day for July to complete. Not only that, I still plan to continue my 250/day on my YA novel to keep it from going stale in my head. Can I pull this off? Well, check back in a month to find out! By the way, if I don’t post to the blog as much during July, you’ll have to forgive me. I’ll be buried in Camp Nano writing. Gomen!